I must have lost around 10kgs taking this shot. In fact I almost felt like Peter Lik! I had to run out to this spot, slam my tripod down, get a quick focus in and then fire the shot all before the next wave came thumping through. It was heaps of fun though even if I did cut it a bit fine a few times. This sort of photography certainly makes you feel alive, though there isn’t much room for error. I hope the rest of you got awesome shots this weekend. This entry was posted in australian seascape photography and tagged australian landscape photographer, australian landscape photography, Australian Landscapes, australian seascape photography, Australian Seascapes, landscapes, seascape photography, seascapes, sunset, waves. Wow. Return of the King of Waves. I love this one Jamie, one of your best. The leading lines and layers are amazing here. 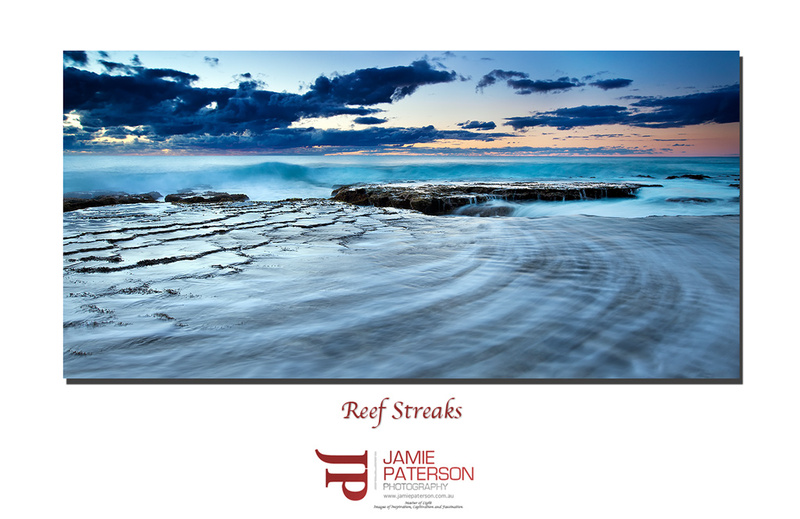 Those streaks are great, the layers of rocks are great, the waves brilliant. One of your very best, you really hit gold here! Ok now I know its a good shot. I must admit Flemming I really ‘felt’ this spot, I think there is so much truth in the notion that we should allow our intuition lead us to where we should photograph. I like you liked the fact that there was three different things going on in this photo at the same time. Good shot, hell yeah! And there’s a lot going on but not too much and the elements work together. There is great drama in the lines and layers. All colours also complement each other, very important. Yep it is up there with one of your best mate, would go great in a competition that is being launched early next week! Thanks for that mate as always I really appreciate the comment. I was looking at entering but the initial terms said it was for non professionals and since I’m selling my photos I was going to ask where you draw the line. I’ll wait to see the T&Cs next week. I really like this one too – unveils the hidden energy a little more than the previous shot but sits nicely next to it anyway. Hmmmm hidden energy is a great way of describing the ocean isn’t? Its a constant moving thing. Excellent photography Jamie. Looks like it would have been hard work, risking life and 5D MII Have to ask the question, where was this beauty taken? I use the 1DsMkIII 😉 It was taken in Mandurah.